Local high school green teams and other interested recyclers, here’s a great way to do your part to reduce waste and help support Bethesda Green. Collect your old cell phones and bring them to Bethesda Green for recycling. We’ve partnered with two of our Green Business Incubator Companies — GreenSavings.Coop and their Supplier Member VertiGO Solutions — to turn your old cell phones into a valuable donation. Just bring your old phones to Bethesda Green — 4825 Cordell Avenue, on the second floor above the Capital One Bank — and deposit them in the VertiGO Box at the front desk. The company’s VertiGO RECOVER service specializes in mobile phone recycling to ensure wireless devices are handled in a way that doesn’t compromise sensitive information or impact the local environment. VertiGO Solutions will make a cash donation to Bethesda Green for the value of any recycled phones. Is your organization looking for some stellar interns this summer? Or, perhaps your organization has a need for interns year round? If so, we have an excellent opportunity in which to participate. On February 25, Bethesda Green will be hosting its third annual Fields of Green Internship Fair. Right now we are in the process of inviting employers looking for highly qualified candidates to sign up to be a part of our fair. Not only will you meet the candidates for the internships face-to-face, but your internship posting will be widely shared among our diverse network as well as posted on our Fields of Green webpage leading up to the event. In year’s past we have matched many amazing candidates with wonderful green job sector opportunities. The U.S. Green Building Council (USGBC) on January 19 released data on the 10 states (plus the District of Columbia) with the largest square footage per capita of commercial and institutional building space to earn LEED certification in 2011. DC was included on the list because it outranked all the leading states, and did so by a healthy margin. The District came in with 31.5 square feet of LEED certified building space per person. In contrast, the top 10 states all ranged between 2.74 and 1.81 square feet per person. In terms of the total square footage of commercial and institutional building space earning LEED certification in 2011, as opposed to the per capita figures, DC came in with more than 18.5 million, Virginia with 19.4 million and Maryland just under 12 million square feet. For anyone interested in starting a small scale farm or for farmers interested in improving their skills, this is for you. University of Maryland Extension, Baltimore County has partnered with Future Harvest – Chesapeake Alliance for Sustainable Agriculture, and the Maryland Agricultural Resource Council to offer a workshop series to learn about starting and operating a successful, intensive small farm. Workshops start January 31 and are held at University of Maryland Extension in Cockeysville. The focus of this series is on small-scale, fruit and vegetable production using conventional, sustainable and organic methods. The program is open to all and is taught by farmers and knowledgeable university faculty. Participants will learn marketing, production and business skills necessary to become successful market farmers. The $40 fee covers the entire workshop series. Please register by January 25. More information in this online PDF. 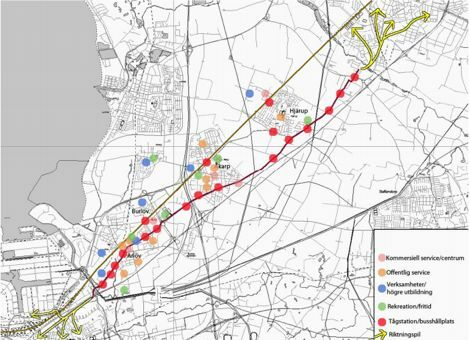 The Swedish Traffic Authority, A. K. Streeter reports in Treehugger, has studied, and now proposes, a four-lane bikeway from Malmo to Lund, two cities about 20 miles apart. Like a limited access highway, the bikeway will have exits, but no roads will intersect it. Bicyclists will have a dual layer of protection from wind consisting of bushes and a solid fence. The bikeway also will include “periodic bicycle service stations.” The intercity route, which will connect the two cities’ downtown areas, is expected to cost $7.1 million. Streeter reports that in Lund, 60% of the population uses bicycles or public transportation to get around. In Malmo, “cycling has increased 30% each year for the last four years.” That last fact would indicate that someone in Malmo, either local government or a very active civic group, has rallied a great many people to switch from cars to bicycles in a short period of time. Surely it can happen here. BG 101, Wednesday, Jan 25, 4:00 – 5:30 pm, at Bethesda Green, 4825 Cordell Avenue, Bethesda, MD 20814. We’re on the second floor above the Capital One Bank branch on the corner of Woodmont and Cordell. Join us for an orientation about Bethesda Green, our history, upcoming events and volunteer opportunities. Documentary film: “Bag It: Is your life too plastic?” Saturday, Feb 4, 7:30 pm- 9:30 p.m. Washington Ethical Society (library), 7750 16th Street, NW, Washington DC 20012 (0.7 miles from Silver Spring Metro Station; S4 Metrobus). “Bag it: Is your life too plastic?” is an eye-opening and funny documentary film that navigates the plastic world. Are plastic bags neccessary? What are plastic bags made from? What happens to plastic bags after they are discarded? The 65-minute award-winning documentary film will give answers to this questions. 65 min. movie followed by 30 min. discussion. Snacks provided; $5 donation requested. RSVPs helpful but drop-ins welcome. Sponsored by the WES Earth Ethics Committee. Email for movie information and RSVP: EarthEthics2@verizon.net or call Sue Jacobson, 301-309-6731. Bethesda Green’s Third Annual Fields of Green Internship Fair, Saturday, Feb 25, 10 am – 2 pm. 4825 Cordell Avenue, Second Floor above the Capital One Bank. The Internship Fair provides college-age young people an opportunity to meet representatives from a number of companies and non-profits offering job experience in the green business sector. More than 20 companies will be in attendance. Learn about academic and government programs, as well as a variety of internships, including those with our own Green Business Incubator companies. Check out more details and internship opportunities here. We’ve had an overwhelming response to attend our TEDx local viewing party — Changing the Way We Eat — this Saturday, Jan 21. While formal registration for the event is closed, guests are invited to visit throughout the day. If you plan to join us for breakfast or lunch, please email cheryl@fullplateventures.com. Lunch is our local, seasonal potluck lunch challenge (see details below). Free weekend parking is available in the public garage on Woodmont Avenue, a block from Bethesda Green. 9 am – 10:30 am — Welcome to Bethesda Green and Who’s in the Room? If you join us for lunch, please bring a seasonal, locally-grown and/or locally produced dish to share — homemade is encouraged — according to the category by last name. Honest Tea, hot tea, and coffee will be provided. There is a refrigerator but no warming facilities. This TEDx local viewing party is presented by: Bethesda Green, Full Plate Ventures, and SlowFood DC. We gratefully acknowledge our sponsors’ food and drink donations for this event: South Mountain Creamery, Honest Tea, and Chesapeake Bay Roasting Company. Electric vehicle charging stations are coming to Bethesda Row, Rockville Town Square, and Congressional Plaza on Rockville Pike. Miami-based Car Charging Group will install Level II, 240-volt, EV charging stations, manufactured by Coulomb Technologies at the three sites, all owned and/or managed by Rockville-based Federal Realty Investment Trust. Drivers will have access to the ChargePoint® Network, an online network connecting EV drivers to unoccupied charging stations. That access means EV owners will have flexible payment options, mapping and driver support services and the ability to make reservations through their mobile apps. “Besides the obvious environmental benefits, a big advantage of electric cars will be the ability to conveniently charge your vehicle when you’re already stopped somewhere on your daily routine,” said Michael D. Farkas, CEO of Car Charging Group. “Changing the Way We Eat” is the topic of an all-day, free event at Bethesda Green on Saturday, January 21. No, it’s not a diet seminar. It’s a day of talks about the growing sustainable food movement here in Montgomery County and around the world – and how we can all hop aboard. The day will be split between live video sessions from New York City and local sessions in Bethesda where attendees can learn about the new Montgomery Food Council, preview a portion of a documentary-in-progress about our local food system and the Montgomery County Ag reserve, share a pot luck lunch of local winter foods, and meet others who are interested in a local sustainable food system. Click to the Bethesda Green event calendar for the where and the when and for more detailed information. One year ago, SemaConnect was a startup with two employees. Today, the Annapolis-based company has a staff of twelve. By this time next year, the Maryland Clean Energy Center reports in its December newsletter, SemaConnect founder and CEO Mahi Reddy expects that number to double. His company’s product is an electric vehicle (EV) charging station. The company developed the ChargePro, with features such as smart grid integration, RFID card authentication and sustainability reporting. SemaConnect also partnered with solar companies, including Advanced Technology and Research (ATR) Corp. of Columbia and TimberRock Energy Solutions of Frederick, to create EV charging stations with solar voltaic panels built onto them. This week marks the introduction of a new local Website, Montgomery County Sustainability News, or MoCo-Sustain.com. The site is dedicated entirely to publishing daily (M-F) news and information that impacts the environmental sustainability of Montgomery County. MoCo-Sustain.com includes links to local resources, and calendar listings of local environmental events, as well as the latest news. The Website is edited by Dan Rudt, who will continue to provide this column of Green News & Events for Bethesda Green. First Thursday Happy Hour @ BlackFinn, Thursday, Jan. 5, 5-8 pm, 4901 Fairmont Avenue, Bethesda. Ring in the New Year w/Bethesda Green. Join us for casual conversation and social networking. What’s your New Year’s Green Resolution? Jot it down with your name and email address. Bring your Green Resolution to the Happy Hour for a chance to win a BlackFinn gift card. We’ll share ideas and publish highlights on our website. Free Screening of Bag It: Is Your Life Too Plastic? January 9, 2012, 7:00 pm, Brookside Gardens Visitor Center. Presented by GreenWheaton, with Brookside Gardens, Silver Spring Green and Safeway. Join us to watch this engaging film about how single-use plastics affect our environment and our health — and simple steps we can take to reduce this waste. Chronicling the global production, use and disposal of plastic bags and other plastics, the film documents the environmental consequences of these products, including the effects of plastics on a wide range of species, lands, waterways and oceans. Traveling the world on a fact-finding mission, the film also identifies smart alternatives and solutions. Plastic will never look the same again! Directed by Suzan Beraza. Produced by Suzan Beraza and Michelle Hill. Free reusable grocery bags from Safeway will be available at the event on a first come first served basis. The event is free, however, tax deductible donations to GreenWheaton are appreciated. Please register now as seating is limited. Bethesda Green Education, Outreach and Marketing (EOM) Group Meeting – Newcomers Welcome! Wednesday, January 11, 4:00 – 5:30 pm., 4825 Cordell Ave., corner of Woodmont Ave., Suite 200, above the Capital One Bank, Bethesda.A team of volunteers, EOM supports all of Bethesda Green’s communication efforts. From recycling to energy efficiency, sustainability to green building/design, EOM expresses the organization’s various areas of expertise in a clear and concise manner via various media. New members are welcome to join. More information here, or contact Bethesda Green Communications Director Dave Heffernan, dvheffernan@bethesdagreen.org. Future Harvest – Chesapeake Alliance for Sustainable Agriculture, 13th Annual Conference, “Farm to Institution: Making Local Food Economies a Reality” January 13-14, National Conference Center, Lansdowne, VA. Two keynote addresses on local food economies, six learning tracks, pre-conference workshops, farmer panel on advocacy and much more! Information and registration here. MLK Day of Service 2012, Monday, January 16, 1:00 – 3:00 pm. Montgomery County will be celebrating Martin Luther King, Jr. Day of Service at North Bethesda Marriott Hotel and Conference Center and at two satellite site locations (Universities at Shady Grove in Gaithersburg and the Silver Spring Civic Building). That is followed by a tribute to Martin Luther King, Jr. at Strathmore Hall at 4:00pm. Volunteers can sign up to participate in this exciting event and learn about the great work that local organizations are doing, find out ways to get involved, and make a difference. More information and registration here. Help the Hungry Food Drive: Support those in need by bringing non perishable food items to the Bethesda North Marriott on Martin Luther King, Jr. Day. Food collection will be located near the Montgomery County Volunteer Center table. Donations will go to Manna Food Center. 2012 “Keep Winter Cold” Polar Bear Plunge sponsored by CCAN, Saturday, January 21, 2012 at 11:00 am, The Beach at National Harbor, Maryland. For seven years, groups of people who care have plunged into cold bodies of water in our region to fight climate change, bring back the Arctic sea ice, and save polar bears. The Polar Bear Plunge is the Chesapeake Climate Action Network’s biggest annual fundraising event. The money we raise during the plunge goes to support our programs to combat global warming at the state level in our area. Information here. BG101, Wednesday, January 25, 4:00 – 5:30 pm, at Bethesda Green. Join us for an orientation about Bethesda Green, our history, upcoming events and volunteer opportunities. Dan Rudt is the editor of Montgomery County Sustainability News, a daily news Website serving the local area with environmental sustainability news, information and events.